Can you identify an impaired employee in the workplace? We offer a staff-development training course to aid your safety leaders in doing just that. 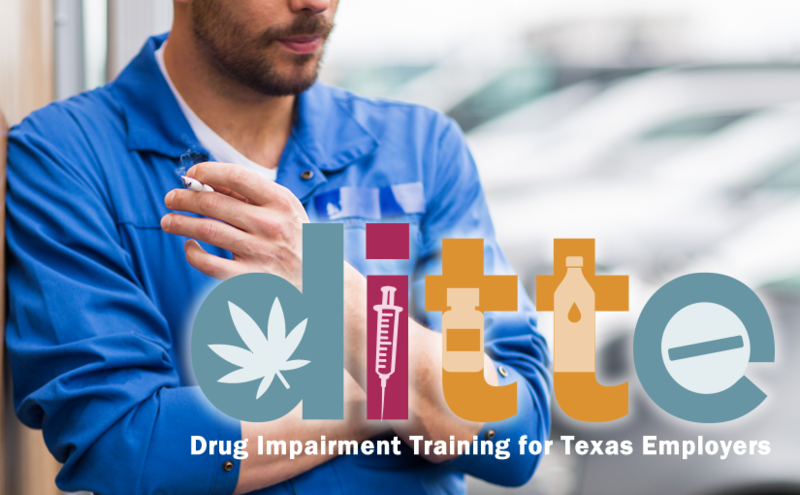 Free Drug Impairment Training for Texas Employers (DITTE) explores the effects of alcohol and other drugs on driving and workplace performance and highlights costs and lifestyle impacts of a DWI-alcohol arrest. Benefits of preventative training for employers and employees also are outlined. Who should attend? Health, safety managers/leads, wellness, human resource, public affairs professionals, business owners, as well as senior and executive management team members. How to educate employees on traffic safety to help reduce the number of alcohol and drug-related incidents on Texas roads. COST: This education is grant-funded by the Texas Department of Transportation (TxDOT). There is NO CHARGE to participants. We now offer two training options — webcast training and on-site training. Click here for an up-to-date list of Our Driving Concern DITTE training sessions. Click here to request Drug Impairment Training for Texas Employers. Texas and Impaired Driving: Learn about DUI driving in Texas (drugs and alcohol), prevalence of incidents and what a driver in a fatal crash looks like, the profile (men vs. women). Texas DWI: Drinking and driving don’t mix. Plan ahead for a sober ride home.